The snub square antiprism is the 85th Johnson solid (J85). Its surface consists of 24 equilateral triangles and 2 squares. 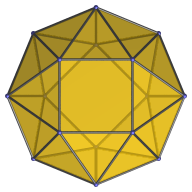 The snub square antiprism is one of the special Johnson solids at the end of Norman Johnson's list that are not directly derived from the uniform polyhedra by cut-and-paste operations. It can be indirectly constructed from a square antiprism by separating it into two halves along a zigzag cut between its triangular faces, suitably deforming the two halves, and joining them together with a belt of 16 triangles. An analogous process can be applied to the tetrahedron, treated as a digonal antiprism, to produce the snub disphenoid (J84). Applied to the octahedron, treated as a triangular antiprism, this process produces the icosahedron. It can also be applied to the pentagonal antiprism to produce a snub pentagonal antiprism; however, the result is no longer convex, and so is not among the Johnson solids. Oblique side view at 22.5° angle. Last updated 18 Mar 2019.